After a good start to our 2019 AFL betting tips, we now shift our focus to the three games onSunday. It’s an interesting slate that we’ve got on our hands, with all three games fairly even in the head-to-head markets. Below, we’ve broken down each fixture and have given our best plays. As always, good to everyone following! First up on Sunday we take a look at an intriguing battle that sees North Melbourne host the Brisbane Lions. The bookies can’t split them in the head to head markets, but we’re confident we’ve found something for punters to get on. The Roos were extremely disappointing in Round 1, perhaps even the worst of any team in the league coming out of the blocks. They allowed a Docker forward line to score 140+ points which is their highest since 2013. They’ll be looking to respond in a big way to avoid starting the season at 0-2. In contrast to the Roos, the Lions were just about the best of any team in Round 1. They put the reigning premiers to the sword with a dominant second half that eventually saw them run out 44-point winners. However, the real test starts now for the young Lions as they look to get some consistency with their performances. Despite the contrasting performances from these clubs in Round 1, we’re not interested in taking either in the head to head market. Time and time again we see experienced teams like North bounce back from big losses, likewise with young teams like the Lions struggling to back up great wins. For this reason, we’ve looked elsewhere for value and believe we’ve found it with the Total Points market. Both teams don’t have potent forward lines and struggle to score 100+ at the best of time. We see this being a low scoring affair in the 140-160-point range. Second up on Sunday we’ve got another tight contest between the Hawks and the Bulldogs at the MCG. Both teams got their campaigns off to good starts, but only one will remain undefeated after this big clash. The Hawks were ultra-impressive in their opening round win over the Crows in Adelaide. Despite being beaten in just about all key statistical areas, when they did have the ball forward of centre, they were clinical and took their chance en route to a great win. Likewise, the Bulldogs were also impressive in their first game of the new season. They shocked the Swans in the first half as they stormed out to a 40-point lead, eventually outlasting the Swans to come home 17-point winners in front of Matt Damon, Chris Hemsworth and the rest of the Bulldogs faithful at Marvel Stadium. The markets have the Hawks as three goal favourites over the Dogs here, which we believe has left a bit of meat on the bone for punters. In our view, their win over the Crows was far more impressive than the Bulldogs victory over the ageing Swans. We see the Hawks going to 2-0 with a comfortable win on Sunday. The final game of Round 2 is in the Gold Coast with the Suns set to host the Dockers. The betting has all been for the Dockers since the market opened as they look to go 2-0 to start the season. The Suns were brave in defeat in their opening round fixture against the Saints. Many predicted the Suns to cop big defeat after big defeat this season, but they’ve shown a bit of early fight which would please their fans. Whether they can back it up with another big effort on Sunday is a different story, though. The Dockers were arguably the best performing team of the week in Round 1 with their huge home win over the Kangaroos. They posted their biggest total score (141) since 2013 and now welcome Jesse Hogan into the attack. A 2-0 start for Ross Lyon’s men would be a surprising but great result for their club. Although the Suns were decent in their loss to the Saints, we expect the Dockers to be too strong here. They have elite talent in Nat Fyfe and Jesse Hogan that the Suns simply do not possess, which we feel will be the difference here. The best Australian sportsbooks are providing a great range of AFL betting promotions this season. Take full advantage of these promos while they are on offer to give you the best chance of a profitable season! For EVERY Round 6 AFL match, place a Head-to-Head bet & if your team is 12 POINTS UP OR MORE at ANY BREAK, Sportsbet pay you out straight away! Sportsbet also offer a fantastic $600 first deposit sign up bonus! Over at BetEasy, if you place a 4+ leg Head-to-Head multi on AFL Round 6 matches and miss by one leg, you'll get your stake back as a Bonus Bet up to $50! Sign up to BetEasy today, and you'll also be able to take advantage of a $200 First Deposit Bonus offer when you deposit just $50! 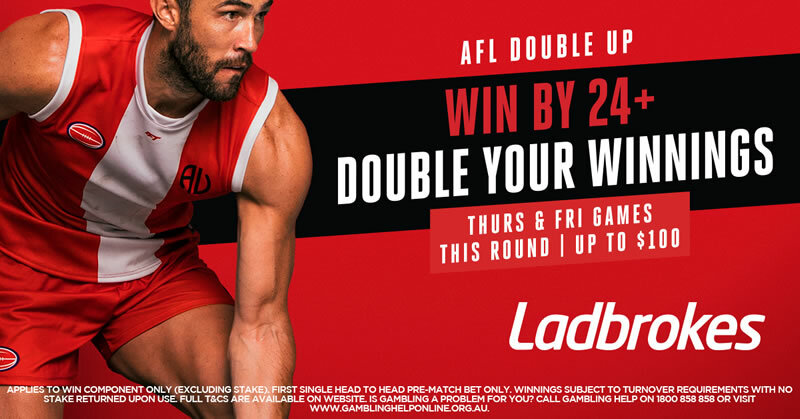 Place a Head-to-Head bet on Thursday or Friday night’s AFL Round 6 match and if your team wins by 24 points or more, Ladbrokes will Double your Winnings up to $100! New customers to Ladbrokes can score themselves a monster $500 first deposit bonus! * Always read the terms and conditions of any promotion carefully. Promotions may not be available to all states. Always gamble responsibly. Before You Bet is Australia's leading provider of sports betting tips, articles, blogs and reviews of the best Australian sports betting websites in the country. We cover a wide variety of sports with a strong focus on AFL, NRL, Horse Racing, NBA, Cricket, Golf, NFL and UFC along with Daily Fantasy Sports, e-sports betting and reality TV betting. We have also partnered with Australia's best online sportsbooks to bring our followers some fantastic promotions and welcome bonus offers. Before You Bet is committed to responsible gambling. Please only bet what you can afford to lose and seek help if betting is no longer enjoyable or is affecting your life. Content on the website is simply the author's opinion and not to be taken as actual advice. Bet at your own risk.